Features: Etched technology creates bright points to be brilliantly visible with a low amount of light diffusion, allowing fibers to maintain a uniform brightness along entire cable length. Remote control on / off switch. Seven-color led light mode, perfect to create the atmosphere. Remote control or manual, adjusting the color change and speed. Rgb light changing fade, jump, spark. Neon-like, uniform illumination through the length of the cable. Distinctive twinkle effect, may be continuous or fixed. Remote lighting with no electricity, heat, uv, and infrared. Elegant and dynamic color change of illumination. Diameter of each fiber: 0. 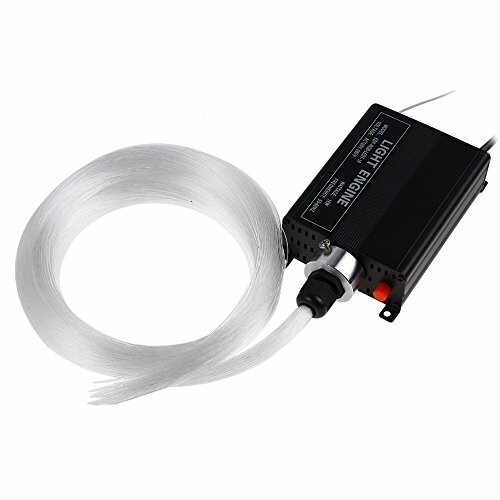 75mm pmma fiber optic cable accessory type: Driving source led chip: Rgbw led quantity of fiber cables: 150pcslength of each fiber cable: 2mwork voltage: Ac 100-265vfrequency: 50-60hzpower: 16wremote: Rf 24 key remote range: 25-30 mcolor: Black package weight: 660g product size (l x w x h): 11. 5 x 8. 5 x 3. 5 cm / 4. 52 x 3. 34 x 1. 38 inches package size (l x w x h): 19 x 13 x 4. 5 cm / 7. 47 x 5. 11 x 1. 77 inches package contents: 1 x 16w rgbw optical fiber engine1 x 24 key rf remote controller1 x 0. 75mm-150pcs-2m optic fiber cable1 x English user manual. Allowing fibers to maintain a uniform brightness along entire cable length. Note: W key not mean pure white light, it's rgbw color lights mix. If you have any questions about this product by LightMe, contact us by completing and submitting the form below. If you are looking for a specif part number, please include it with your message.